format, including external hard drives, etc. actually talking about how to do it. on your USB drive. You can also set disk quotas and even create partitions! However, there are also a few drawbacks to using NFTS on a USB drive. NTFS file systems, nor can most Linux systems. First, connect your USB device to your computer. Then right-click on My Computer from the desktop and choose Manage. Next click on Device Manager and then expand out Disk Drives. You should see your USB drive listed there as “Generic USB 2.0 USB Drive” or something similar. 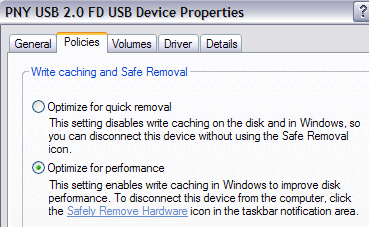 Now right-click on the USB drive under Disk Drives and choose Properties. Then go to the Policies tab. Now you will see two options, the “Optimize for quick removal” selected by default. Go ahead and change that by selecting the “Optimize for performance” option. This enables writing caching on the drive and therefore allows you to format it as NTFS! Sweet. That’s it. Now click OK and then go to My Computer. Right click on the drive in My Computer and choose Format. In the File System drop down you will now see the option for NTFS!